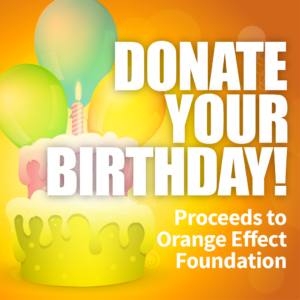 Donate Your Birthday to OEF! It’s super easy. Instead of birthday gifts, ask for donations to help children with speech disorders. Since we began awarding grants in 2015, the Orange Effect Foundation (OEF) has purchased 24 speech generating devices and provided over 2,500 hours of speech therapy. With your help, we’ve reached hundreds of children in 26 states…but, thousands of kids in every state are going without the speech therapy or devices they need. This can’t happen…but you can help by donating your birthday! It’s easy. Just complete this simple form to get started! It’s simple – just pledge to donate your birthday and then share your pledge with your friends to let them know you’re serious. At this time, we are asking that you do this using your Facebook account. Simply, fill out this no-obligation form to dedicate your birthday to The Orange Effect Foundation. If you want, consider your half birthday, a child or loved one’s birthday, or just a favorite day of yours (we honestly don’t care…we just want to help the kids). By sharing your email address and special date with us, we’ll then be able to provide you with everything you need for your fundraiser a few weeks prior: links, images, ideas on how to promote your fundraiser, and more. To hit our need goal for this year, we need one thousand people to set a goal of $750 for each campaign. If you think you can/should raise more…that’s great, but we’re hoping you can deliver $750 for your birthday or special occasion (btw, that alone covers 10 hours of speech therapy!). Thank you in advance for your support. The Orange Effect Foundation, our board members, our community and families, and most importantly, our young donor recipients, thank you. If you’d like a head start, check out our Donate Your Birthday Took Kit! *Would you like more information on corporate sponsorships or our annual Golf for Autism? Contact us for details.